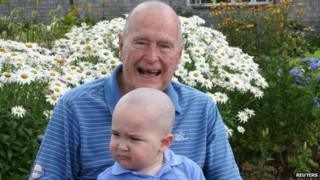 Former US President George H W Bush has shaved his head to show support for a boy who has leukaemia. A Secret Service agent in his security detail has a two-year-old son who is losing his hair as a side-effect of treatment for the cancer. The 89-year-old Republican lost his greying locks earlier this week at his coastal home in the state of Maine, said a spokesman on Wednesday. Mr Bush acted after he saw other agents in his detail had shaved their heads. A Bush spokesman identified the toddler only as Patrick. Mr Bush and his wife, Barbara, lost their second child, four-year-old Robin, to leukaemia almost 60 years ago. The security detail have launched a website to help pay for Patrick's medical treatment. Mr Bush, whose son is former President George W Bush, was only himself released from hospital in January, two months after his admission for a bronchitis-related cough. He was the 41st US president, and served one term in office, from 1989-1993. The British and Irish governments launch the initiative following the killing of Lyra McKee. Beyond Today: What is justice in the age of Trump? Quiz of the Week: Which big thinker influenced boy band BTS? What are the rules for 'buying and selling' babies? Is Greta Thunberg right about UK climate claims? Why aren't there more young councillors? How do you find the one?